I think you’ll agree when I say Pokemon Go has taken the world by storm. The phenomenon has brought people together from far and wide for one reason: to “CATCH THEM ALL”! So what does Pokemon have to do with your business? Many businesses have seen a huge increase in foot traffic and sales, some of which are clients we market for. With this tremendous amount of foot traffic, we saw a way to for each of our clients to capitalize on it. …and in today’s post, I’m going to show you some of the strategies we used for our clients that helped increase their revenue by over 63%. Pokemon hunters are everywhere playing the game, even three months after the game has been released. All you have to do is figure out if you have to go to them or if you can get them to come to you. 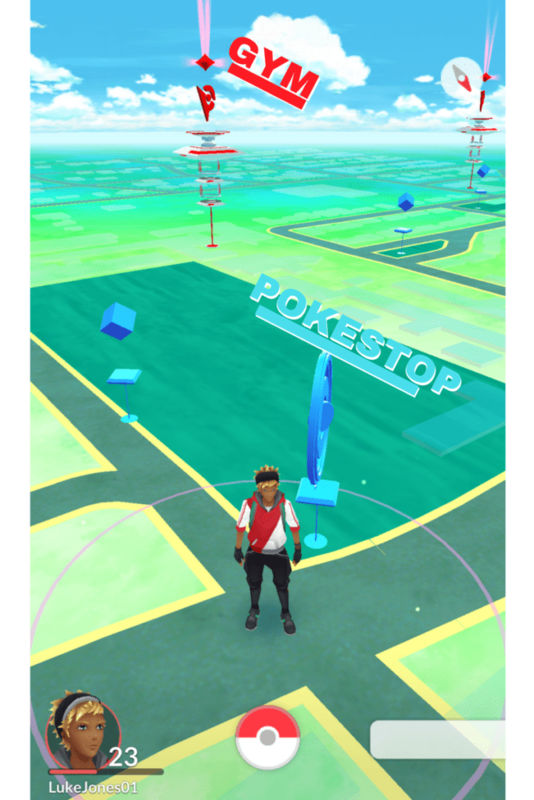 Check to see if you have any Pokestops or Gyms near you. The reason these items in the game are so important is because Pokestops give free items like Pokeballs (what you use to catch Pokemon), cherries, revives, and etc while a gym is used to test and see what color team has the strongest Pokemon. Now, if you’ve looked around and your location is filled with items (like the image below) then you’re in luck–you can attract people to you. But if you don’t see any pokestops or gyms near your location then skip down to the “Bringing your business to them” section. Since your location is filled with Pokestops and gyms you’re in luck, you can attract many people to your location with just a few easy steps. Pokestops are fairly easy to use. All you want to do is add lures to the pokestop; when a lure is added all other Pokemon go players in the area will see it. The more pokestops you have in your area with lures added to them the more people you will see walking around your area. Once lures have been added have your team watch for players walking by and initiate a conversation to have them step into your store. If your team color owns the gym you get a discount on any drink, food, clothes, etc. One player from any team color that owns the gym at the top of the hour, will get a free shirt — raffle style. Any color that holds the gym down, every hour / every 24 hours will receive something cheap or free and every time the time lapses and they still own the gym the receive more. Social media is a great tool, and you can use it to advertise your locations lures, gyms, promotions, and etc to attract even more players. All you have to do is setup your Facebook, Instagram, Twitter campaign, with a video of your customers coming into play the game and advertise to that target market. Giving free instances or lure to every that comes into your location, takes a picture of them catching a Pokemon, and tags you on their social media. In every major city, there is always one area where there are a ridiculous amount of pokestops and lures and users are always there catching more Pokemon and getting more items. In Miami, those two hotspots are Midtown and Bayfront park. I’ve been to Bayfront park and watched as hundreds of people come and go just to play Pokemon GO, and as I was watching and playing, there was a dominoes delivery driver who came with 25 medium pizzas and began to sell them like hot cakes. There are many ways to find lure hotspots, but the easiest way is to just ask your Pokemon playing customers. Pokecrawls are a great way to get many people moving, drinking, and having fun but it’s also a great way to advertise your business and generate sales. This will work best if you own a bar, grill, or restaurant. If there is already some Pokecrawls happening near you partner up with the organizer and offer them a special deal to their attendees on food and drinks. I’ve seen Pokecrawls marketed on Meetups, Groupon, Eventbrite, and across all social media platforms so players can attend and have a weekend of fun. You can also sponsor a local Pokecrawl, by purchasing the first round of drinks at their first location, giving away t-shirts, and much more. Like I said above, there are millions of things you can do to get these Pokemon lovers through your door or get you to advertise to them you just have to get creative. Don’t let this Pokemon Go craze pass you by without capitalizing on the vast amount of people outside playing. Just coming up with a creative idea and implementing it can be the difference between you and your business increasing sales by 63% or just maintaining the status quo. Anyone who can beat your strongest Pokemon at your location’s gym get’s a free drink, shirt, lure, etc. Everyone able to take a picture of your logo with them catching a Pokemon and posts it up on their social gets a gift. Try it yourself, let us know what creative ideas you’ve tied in with the use of Pokemon Go. Comment below or use the #pokemongo4business and we’ll see all the awesome marketing ideas you guys have used for your businesses.